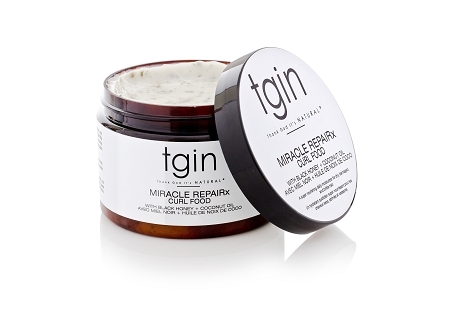 Restoring nutrients into the hair, the Miracle RepaiRx Curl Food Daily Moisturizer is the herbal solution to dry, damaged hair. This daily moisturizer uses coconut oil and black honey to add healing hydration into your styling routine, controlling dryness and frizz. Free from parabens, sulfates, petrolatum, lanolin, artificial colors, or animal testing. INGREDIENTS: WATER (AQUA), RAW BLACK HONEY, COCOS NUCIFERA (COCONUT) OIL, AGAVE AMERICANA LEAF (AGAVE) EXTRACT, CARICA PAPAYA FRUIT (PAPAYA) EXTRACT, GINGER ROOT (GINGER) EXTRACT, GARDENIA TAHITENSIS (MONOI) FLOWER EXTRACT, EUTERPE OLERACEA (ACAI) FRUIT EXTRACT, ARCTIUM LAPPA (BURDOCK) ROOT EXTRACT, MORINGA OLEIFERA LEAF (MORINGA) EXTRACT, GLYCERIN, BUTYROSPERMUM PARKII (SHEA BUTTER), CETEARYL ALCOHOL, AMODIMETHICONE, BRASSICAMDOPROPYLDIMETHYLAMINE, THEOBROMA CACAO (COCOA) SEED BUTTER, PRUNUS AMYGDALYS (SWEET ALMOND) OIL, TRITCUM-VULGARE (WHEAT) GERM OIL, PEG 4 HYDROGENATED CASTOR OIL, CETEARETH-20, ALOE BARBADENSIS LEAF JUICE, HYDROLYZED SOY PROTEIN, PANTHENOL (PRO-VITAMIN B5), ASPATRIC ACID, FRAGRANCE, CYCLOPENTASILOXANE, IODOPROPYNYL BUTYLCARBAMATE, DMDM HYDANTOIN, BENZOPHENONE-3, OCOPHERYLACETATE (VITAMIN E), TETRASODIUM EDTA, SIMETHICONE, BHT. This is my first time EVER leaving a review! I can’t get over how nice my 4c textured hair felt after this. Styling wa so easy. The curl food literally glided through my hair it felt so good. The curl food has been doing a great job at restoring my color damaged hair. I can’t get enough of it! My hair literally eats this stuff up! My hair literally eats this stuff up! It absorbs so easily into my hair and leaves it feeling super soft. Each time I use it I get so many compliments on my hair smell and how shiny and healthy it looks. This has to be my favorite product from the Miracle RepaiRx line. It defines my curls and keeps my hair soft. It’s a thick cream and a little definitely goes a long way. It is perfect to use when doing the LOC method. It also smells yummy! I used the Miracle RepaiRX Line to complete the L.O.C. method on my routine wash n go. The results were amazing! The curl food added great definition to each hair strand! I could really see my curl pattern. Thanks for such amazing products! !